I’m lucky to have many friends who are as enthusiastic as me about cooking (or at least eating) good food. I knew the soups at the Soup Swap would all be great, and I was not disappointed. I won’t name names, but even the person who claimed they “don’t know how to cook” did a great job. So here are the other three recipes from the Soup Swap: a creamy chicken noodle, an Eastern-European-inspired cabbage stew, and a lamb-barley soup with escarole. They’re all very different but all fabulous in their own way. Oh, and my original intention of having extra soup to put in the freezer did not come to pass… everything was so good that nothing made it that far. I didn’t even share with Marvin. Sorry hon! We’ll have to do another one soon. Directions: Skin the chicken, rinse and pat dry with paper towels. 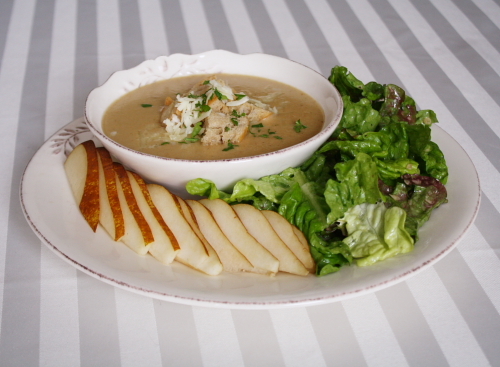 Place the chicken, water, 1/2 cup chopped celery, parsley, salt, pepper, thyme and bay leaf in a Dutch oven or stock pot. Bring to a boil and then reduce heat. Simmer, covered, for 30 minutes. Add the sliced celery, carrots, and onions; cover and simmer for another 30 minutes or until the chicken is tender and no longer pink. Turn off heat, remove chicken with a slotted spoon and set aside to cool. When cool enough, debone the chicken, discard the bones and chop the chicken; set aside. Heat the soup to boiling. Add the noodles; cook for 5 minutes. Stir in 1 1/2 cups of the milk and the peas. Combine the remaining 1/2 cup milk and the flour in a screw-top jar and shake until smooth (or whisk together in a bowl); stir into the soup. Cook, stirring, until thickened and bubbly. Stir in the chicken and cook for another minute or two to heat through. This is a good option for the vegetarians out there- meatless but hearty and satisfying enough to make a meal out of. The starch from the potato and rice combines with the juice from the tomatoes and makes the soup have a “creamy” tomato base. The sour cream and horseradish garnishes bring it all home. Directions: Put the stock and water in the microwave or in a saucepan on the stove and heat until simmering. Meanwhile, put 2-3 tbs oil or butter in a soup pot and place over medium heat. 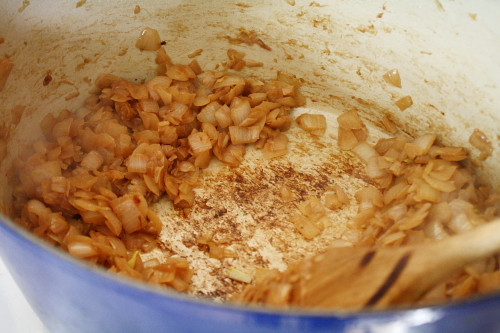 Add the onions and bay leaves and cook for a few minutes, stirring. Add the cabbage and sugar and cook until cabbage begins to soften, 3-5 minutes. Add the celery, carrot and potato; cook another 5 minutes. Add the heated stock and water, crushed tomatoes, and sauerkraut. Simmer until vegetables are almost done, then add rice. Simmer until rice is fully cooked. 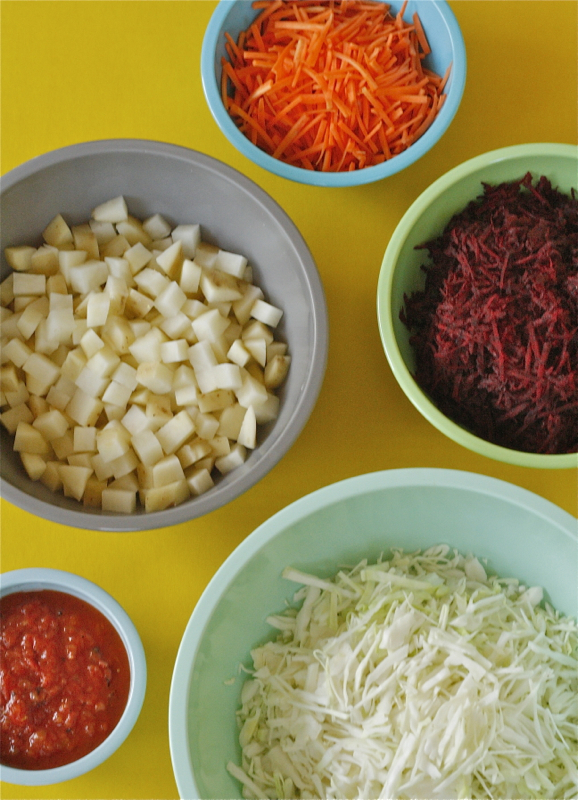 Taste for salt, pepper and acidity, adding more sauerkraut and/or juice to taste. To serve, garnish with a dollop of sour cream and a dab of horseradish. 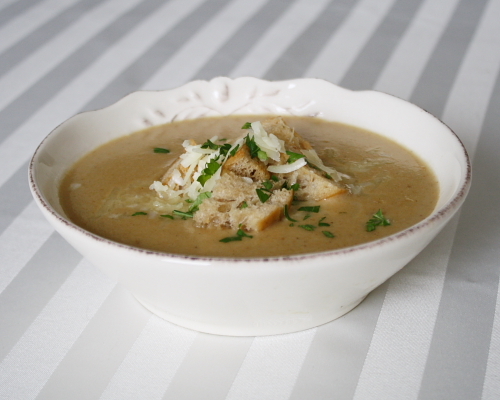 This delicious soup manages to be rich and light at the same time, and will be eagerly devoured by the pregnant and non-pregnant alike. For the non-pregnant, I highly recommend a glass of Shiraz, Malbec or Côtes du Rhône to wash it down. Notes: If you’re not a fan of lamb, you can substitute beef chuck roast. If you can’t find escarole, you can substitute chopped chard or kale, stems and thick ribs removed. If using kale, just put it in about 30-40 minutes before the end of the cooking time. Chard would probably take 10-15 minutes to cook. Directions: Heat the olive oil in a Dutch oven or heavy-bottomed soup pot over medium-high heat. Meanwhile, season the meat with salt and pepper. When the oil is hot, carefully place the meat in the pot (watch for splattering). Sear the meat, stirring occasionally until well browned on all sides. 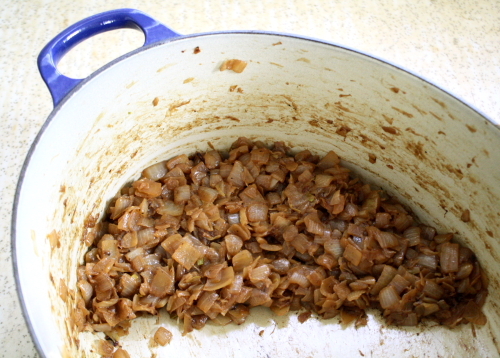 Using tongs or a slotted spoon, remove meat from pot and set aside. Reduce heat to medium and add the garlic, onions, herbs, and a sprinkle of salt to the pot. Add a little more olive oil if necessary so nothing sticks. Cook for a few minutes, stirring, until the onion starts to become translucent. Add the carrot and celery and cook 2-3 more minutes, stirring often. Return the meat to the pot. Raise the heat slightly, cover the pot and sweat the ingredients for 3 minutes. Raise the heat to high and add the barley, broth and tomatoes with their juice. Cover the pot again and bring the soup to a boil. Reduce the heat to a simmer and cook until the meat is tender, about 1 hr 15 minutes. Stir in the escarole. It will begin to wilt immediately. Season the soup with black pepper and, if necessary, more salt.